Remember, remember! The fifth of November. Guy Fawkes and his companions Did the scheme contrive, To blow the King and Parliament All up alive. But, by God's providence, him they catch With a dark lantern, lighting a match! A stick and a stake For King James's sake! 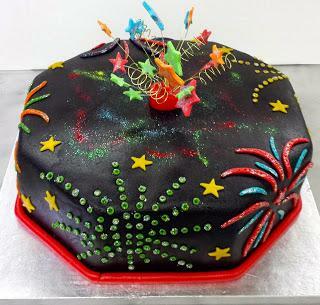 Over 400 years later We lie in the wake Laughing while working At Family Cake No cake is too sweet For Anna to bake Her latest masterpiece, A fireworks cake A colorful and tasty display For King’s James’s sake! It is the transition period between Halloween and The Christmas Season, but that doesn’t mean Anna hasn’t been busy on a themed cake for a holiday. Thanks to a failed terrorist plot on our country over 400 years ago, we celebrated Guy Fawkes Day on Tuesday, and what’s better to go along with fire than some cake! Guy may have failed to light the gunpowder under the House of Lords back in the day, but it doesn’t mean we cant light up some candles for the occasion nowadays! Indulge your eyes upon Anna’s latest creation, and stay tuned in to our blog for upcoming goodies and recipes during the fast approaching Christmas Season : )!